In 1953, Leland Snow constructed his first crop-duster Model S-1 before graduation from Texas A&M University. The Texas A&M College Aircraft Research Center is known from the AG-1 Agricultural plane that was designed by Fred Weick in 1950. The AG-1 might be considered as the mother of all modern crop-sprayers in the world. The prototype Model S-1 (N5385N c/n 1001) was extensively tested in South America before the improved Model S-2 reached production. The pre-production prototype Model S-2, was first flown in 1956. Production of the S-2B by Snow Aeronautical Company started in 1958. North American Rockwell acquired the design and production-rights of the S-2 series in November 1965. 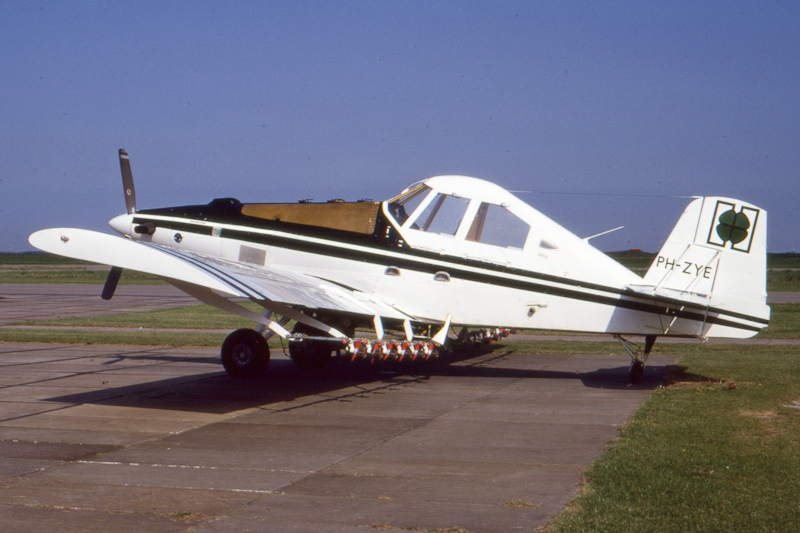 The S-2R was marketed by the growing Aero Commander Division of Rockwell. Ayres Corporation took over the rights in 1977. The Ayres S-2R-T34 Turbo Thrush c/n T34-043DC was registered first N4022S with Ayres Corp., Albany, Georgia. On 25 February 1981, registration N4022S was cancelled as exported to Holland. On 15 April 1981, the Ayres S-2R-T34 Turbo Thrush was registered PH-ZYE in the Netherlands with A.A.A. Heijboer, Biddinghuizen. On 26 November 1991, Heijboer BV, Biddinghuizen, was registered as owner. On 7 September 1993, Lease Plan Nederland N.V., Almere, was registered as owner and Heijboer BV, Biddinghuizen, as holder of the PH-ZYE. On 22 June 1998, registration PH-ZYE was cancelled as exported to Israel and re-registered 4X-AQG.